Bread is one of those foods that, when made with your own hands, gives a great deal of satisfaction and delight. It's only flour and water but it symbolises so much. I bake bread most days and use a variety of flours that I buy in bulk. Often I make a sandwich loaf because we use most of our bread for lunchtime sandwiches and for toast. Every so often I branch out to make a different type of loaf. I have tried sour dough in the past but I've not been happy with any of them. 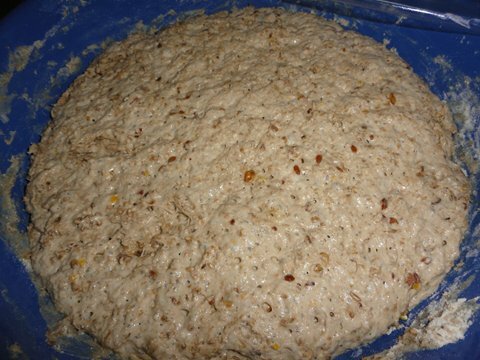 I'll continue to experiment with sour dough because I like the idea of using wild yeasts and saving the starter over a number of years to develop the flavour and become a part of the family. However, the loaf I've been branching out to most often is just a plain old five minute bread. By five minutes I mean it takes about five minutes actual work to prepare but it's the easiest of all bread to make and to get consistently good loaves from. If you're having people around for lunch or dinner, this is the bread you'd bake, not the plain old sandwich loaf. I'm sure there are many ways to make this bread, this is how I do it. It is the old New York Times recipe. Late in the afternoon before the day you want the bread, take a large bowl and measure in three cups of flour - I'm using organic unbleached white and a German rye with grains at the moment. Either of them will do, or any flour you have on hand, including plain/all purpose flour. Add ¼ teaspoon of dry yeast and a teaspoon of salt, or less if you're on a salt restriction. Mix the dry ingredients together. Add 1½ cups water and mix the ingredients together with your hands until all the flour and water have mixed together completely. This mixing (not kneading) will take less than a minute. If you have to add slightly more water or flour to get a moist dough, do so. The amount of flour and water you use will depend on the type of flour you use, and your climate. Flour is effected by humidity and you use less water in humid weather. Cover the bowl with plastic wrap and leave it on the kitchen bench overnight. 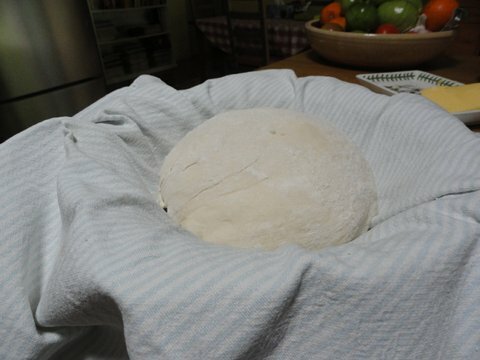 During the night it will puff up and expand, but not as much as your regular bread dough does. 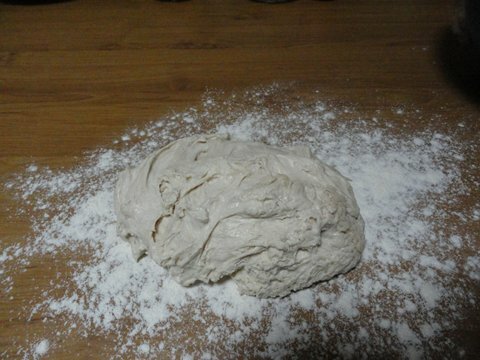 The next day, turn the dough out onto a floured surface and knead it. You want it to look smooth and to all come together, but this will only take a minute, no longer. Form the dough into a tight ball, with a smooth top and a folded bottom and place this ball on a clean tea towel - just to help you carry it over to the oven. About 15 minutes before you're ready to put the dough in the oven, place a cast iron dutch oven, with lid, in the hot oven and let it heat up to about 260C/500F - or as high as your oven will go. When it's really hot, slide the oven shelf out slightly to give yourself a bit of room, bring the dough over to the oven and plop it into the dutch oven, smooth side up and snip the top of the loaf with a pair of scissors. 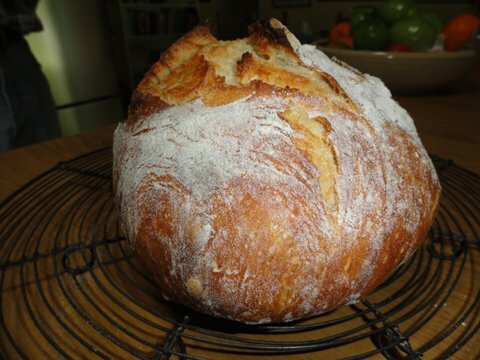 This helps the loaf rise and will give you that rustic look you want in a loaf like this. Put the lid on the dutch oven, close the door of your oven and let it bake for 30 minutes. After 30 minutes, turn down the heat to 200C/390F, remove the lid and let cook for another 15 - 30 minutes (depending on your oven). Same recipe using rye and grain flour. The type of container you bake in is important. It must have a lid to give the loaf a steamy environment in which to cook. The container needs to get really hot because it's the very high heat when you start that gives the bread a great oven lift so it bakes as a tight ball and doesn't spread out over the bottom of the pan. I don't grease my dutch oven but I do put in a small disc of baking paper on the base that I don't change every time I bake. You can also use a pyrex bowl with lid or an oven-proof stainless steel pan with lid but I don't think they work quite as well as the cast iron. They will give you a good loaf though. For a larger loaf, use 5 cups of flour, 2½ cups water, 1½ teaspoons salt and ½ teaspoon dried yeast. Using this method you'll great a great loaf for very little effort and even though it's not a real sour dough, it looks like one and it has a good taste. The crust is crunchy and chewy but it goes softer as the loaf cools. It has a good flavour but it's not as developed or complex as a good sour dough loaf. Still, for an everyday loaf that doesn't take much effort, this one is a beauty. I hope you try it. Rhonda, After kneading the dough and forming it into a ball, do you allow any time for rising or put it right into the oven? For sourdough, I recommend a combination of the River Cottage way of making a starter, and then the Tassajara method of actually using it & baking the bread. I get excellent results this way, and it is now my main method of making bread. Thanks so much for this recipe, just what I need when the freezer is running low on sourdough bread and guests expected. Sourdough is a bit of a commitment but I've figured out how to keep the starter going on as little as one teaspoon of flour per day, building the amount only when I want to bake bread - that takes a couple of days, so your quick bread recipe will come in very handy. Looks so yummy I will give it a try when we next have bread! Deborah, you can let it rise if you want to but it doesn't need it. I've left the dough for an hour after being called away, I've put the dough straight in the oven. You get a good loaf either way. I love making bread, getting my hands in and feeling it, I've been using my Aunt's recipe that she's used for over 60 years. Sometimes I heat up a pizza stone and put a loaf on that, also the kids always want to help with the bread and love to make there own creations of rolls while dad loves to make knot rolls. Another favorite I make is cheese and herb baguettes, great for hot dog rolls and hamburgers, I've even been making soft pretzels as well lately, when they are fresh look out the kids devour them. It is great to watch the kids make and eat all things homemade, they love having there mates over and making food with them and sharing (bragging) with there school mates about what dad or they made. Enjoy the rain Rhonda and to all have a GREAT dough experience. That sounds easy, I'm new at making my own bread. I have been using a bread machine which has been great but I'm going to give this a go. Love your blog its so inspiring. Your bread looks absolutely delicious!! I especially like the rye and grain version. Where did you get the German rye flour? Anke, I have made it with Laucke German Grain Bread Mix but usually use plain rye flour to which I add a handful of soaked grains. Oh, I get my bread flour from Simply Good at Morayfield. Coincidentally a couple of weeks ago a friend gave me a very similar recipe. The only difference being is her recipe doesn't need any kneading. I've made a few loaves over the last 2 weeks and they have been beautiful...and successful...which is saying something as I've had quite a few bread making failures. I want to try this bread but don't have a Dutch Oven-any suggestions on what I can use? Bread over the last couple of years has become such a joy to make. There is very rarely a loaf that comes out of the oven, that I don't get a little bit excited by. What will it look like? What will it taste like? The simple things like hearing the 'sighing' of the sourdough popping it's bubbles. Or the loaves that 'sing' after they have come out of the oven and are cooling down on a rack. And the best bit? Getting to play with the different flours, seeds, fruit, or nuts. All the wonderful things to pop into a dough. All the different variations you can do. ...actually, I think I'll go and get another slice now. When weare having guests for dinner. It seems to make the meal so much more special. It costs $5.00 in our community. I look forward to trying it soon. I just made my first loaf in the bread machine and now am thinking I need to set the machine aside and try this one! I have made this bread in a stoneware casserole dish with a tight fitting lid. I have 2 different ones I use, one wide, shallow for a wider, flatter loaf, and a taller, smaller diameter one for a higher loaf. Both make good loaves. The original post from the New York Times has some helpful hints for new bakers. Do you know the reference, Rhonda? I think it was something like "Artisan bread in 5 minutes a Day" or something similar. We bake sourdough once a week. Rather than feeding the starter daily, we make a doughball - take extra starter left over from when making your bread (about 50g) and add enough flour so that it has the consistency of plasticine. Leave in the fridge for up to two weeks. To bring it back to a normal more liquid starter add it to equal quantities of flour and luke-warm water (we do 200g) - doing this the night before you want to bake works well. With two people working and not a lot of spare time, this has made sourdough manageable for us. Thanks for sharing I'm going to try this loaf. I noticed there were various sizes of cast iron dutch ovens on sale at Aldi this week if anyone is interested. Suzanne, a dutch oven is a cast iron pot with a lid. I usually cook stews and curries in ours. Wow, this one is new to me even though you refer to it as an old recipe from the NY Times. Thanks! Yum! Looks so delicious and I am inspired to give bread making a go. I have already made your orange caked multiple times. Again delicious and so simple. Rhonda, I am 29 years old and follow you blog daily. I feel like I am at the start of a wonderful journey - to live more simply and eco-friendly. The most valuable advice I have taken from your blog is to live your own life - not what mainstream media / society dictates. I am making daily baby steps but feel more peaceful and content. I purchased your book and it inspired me to cancel my credit card. It's a lovely feeling to not have that plastic debt in my purse. Next goal is to purchase a house and become mortgage-free as quickly as possible. Thank you for your advice. I love jumping on here every morning and reading what you and your wonderful readers have to say. I love this post Rhonda. I think I feel my happiest, like the best homekeeper, when I am kneading our daily bread. We buy 25 kilo sacks of spelt, rye, wholemeal and sifted wholemeal and experiment with different combinations. We are pretty obsessed with the River Cottage bread book at the moment. Especially since we have started baking with a wood fired cooker. Hi Kate, yep, we're all fine and dandy here. I haven't seen the River Cottage bread book. I'm hoping you have some recipes or photos on your blog. I don't have a dutch oven, but I have recently bought a cast iron french pan, from Aldi, which is similar although a little wider and shorter. Perhaps it would still work if I flattened the dough a little? Also, the instructions said not to heat the pan empty - something about cracking the enamel lining I think. Does anyone know how I could use the pan for this recipe, without damaging it? I don't know much about cast iron, this being my first pot. Hi - when you say any flour will work does that mean it doesn't have to be 'strong' flour and so can be the regular one I use for baking? One of the reasons I don't bake bread is that I haven't managed to find how to fit it into a good daily routine. This sounds perfect as it can be done the evening before. Thanks. Lily. I have made this bread so many times, it never fails. So delicious. Lily, I haven't made it using ordinary baking flour but in the materials I read along the way, the originator of the recipe said it can be made using plain or all purpose flour. Good luck with it! I am about to invest in a dutch oven, was looking at a 24cm one, as is only three of us, but would this be large enough to bake the loaf. Going for a french one this time, tried a cheaper one but was not good. Round, oval or buffet so much choice would love some advice as they are expensive. The "Artisan Bread in Five Minutes a Day" recipe comes from a book from the same name and it is slightly different. It uses a lot of yeast, so there's a shorter rise time when you first make the batch. I've had great results with it,made it many times, but I look forward to using this recipe with your great instructions. I want to try a recipe that uses less yeast and grows slowly over a longer period of time. It's not sourdough, at least the one I make isn't, but it can develop a bit of a sour taste. 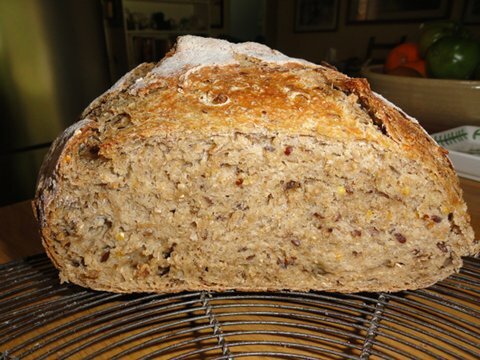 However, it makes a great loaf that's similar to some of the non-sour specialty breads at the store. You're right, Michele. The Artisan Bread book was published in 2007. This recipe was published in the NY Times in 2006 and made by Mark Bittman. That bread looks superb, I am only just getting into bread baking and really loving it. I have a Herman the German Friendship Cake starter which has been living with us for months and I use it to make sweet breads as it has yeasts in which keep it bubbling away on the side. My favourite is a no knead fruit loaf with Malt Extract in, it is fantastic and the recipe I use is similar to your method. This looks like the best bread recipe I have ever come across. I can't wait to try it tomorrow morning. I have tried a bread maker in the past, but I was still not happy with the results. I desperatly want an easy successful bread recipe I can make for my family and stop the huge amount of plastic bread bags filling my bin. I am SO excited about this recipe. Two factors have kept me from making bread lately: it's been super hot, and I'm eight months pregnant! The best I've been able to muster is a batch of quick-drop biscuits every so often. This bread is exactly what I need. It's currently 8PM here in Maine, so I'm going to start it now. Thanks! Made the 5 minute loaf yesterday, cooked in my vintage cast iron camp oven. Very pleased with result, will be making another today! Allana, great! Andrea, glad you finally got your good loaf. Enchanted, let me know how the loaf goes in your new pan. Susan, great news. Thanks for the feedback, everyone. Rhonda this was a little miracle! I never liked bread I made before, but this one turned out so wonderfully that I took a snap with my phone. You asked us to let you know how we went, so here it is. I just cooked a loaf from this recipe - it is amazing! Hi Rhonda, my pyrex casserole dish is only 22cm wide at the top. The lid isn't very tall. Would this be big enough ? The other option I have is to use a pizza stone. Do you know how I could adapt the reipe for this ? wendy, the container needs to be big enough to fit the finished bread. It also needs to have a lid - it has to cook in a steamy environment. Could you use the pizza stone with a metal bowl upturned over the top. I guess the only way is to try it. Sooooo excited, I just read about your 5 minute bread and I have a cast iron dutch oven...just waiting to finish work for the evening to head home and start this bread!!!! Wendy, I make a similar bread to this using my pizza stone. To create the steamy environment we use a pyrex dish at the bottom of the oven filled with water. Always works a treat, hope it works for you too! Rhonda, thanks for sharing this recipe. I am certainly going to give it a go as I love the fact the night time does the work! We usually use a bread maker but decided to try this which is pretty much the same as damper bread that we make when we go camping which is made with just flour and water and cooked in the camp oven on the coals of the fire. The loaf looked good and was very crusty but also very chewy which I find difficult to eat. This could be because the flour I used was strong flour but two years old. I cooked it in the cast iron camp oven in my electric oven. 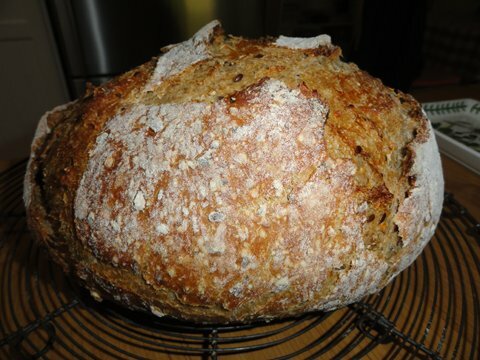 So, bought some laucke German grain bread which is sitting in the bowl on the bench as I write this. Will let you know how it turns out. I love things like this that are simple, easy to make, easy to remember and satisfying because I did it myself. Made the bread with the laucke German grain flour and it was fantastic. It looked just like the one in your photo Ronda. It will become a staple in our home from now on and am going to experiment with it. I love your blog and the inspiration you have given me. Thank you. I have been making bread in our bread machine for years, but the five minute bread is the best I've ever made and so easy. Thank you for sharing it with us all. Thank you for this recipe ... made it on the weekend and it turned out really well. The only "down side" was that the plastic part of my le creseut lid melted! Fantastic recipe Rhonda! My loaf turned out beautifully. Only one drawback, that the oven was too hot for the knob on top of my lovely Le Creuset pot and a piece of it flaked off! Never mind. It's stil functional, though i won't be baking bread in it again, but plan to get a cast iron dutch oven that you can use over an open fire. We've been wanting to get one for camping in any case... And the bread was so good that I have to make it as a regular thing! Thanks again for the recipe and all the other wonderful things you share here. Great bread and so very easy. Many thanks Rhonda. I made this yesterday. OMG!! It tasted so good. Thank you so much for sharing this great method. I think I shall be using it from now on. This may be a silly question, but do you add your disk of baking paper when you put the pan in the oven to heat or when you add the bread? I put it in with the pan and it burned.... I guess I have answered my own question! Hi Deb, yes you answered your own question. You add the paper when you add the bread. I hope it turned out well for you. The end result was excellent. I have been asked to bake another for tomorrow's breakfast. It doesn't take as long in my oven, I only needed 5 mins with the lid off. Greetings from Tassie. Wonderful loaf. Thank you Rhonda. I'm so glad to have found your 5 min bread recipe while I was browsing some new items on Pinterest. 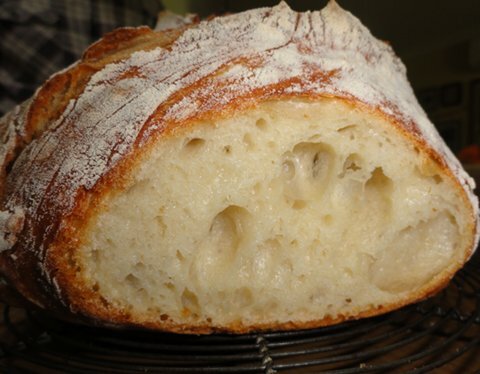 The bread I make most often is sourdough which uses a starter that I made about 3 years ago. I love making sourdough but it is quite time consuming and involves a fair amount of kneading. I made your 5 min bread yesterday and it was so easy and required so little effort. The result however, was amazing-golden and crusty on the outside and just like ciabatta on the inside. My family loved it. I'll be making this bread regularly now. Thank you for the recipe and for the wonderful ideas and inspiration on your blog and in your books. I particularly love "Down to Earth". Regards, Maria. So glad to find your 5 minute bread recipe. I've been baking bread for many years, and I've found that the crusty, artisan breads can be very time consuming. Yours was so easy, I used white bread flour as that's all I had. Just took it out of the oven a few minutes ago, and it's beautiful. Taste test tonight with tonight's lasagna. Hi Rhonda. I have made your recipe many times but it never comes out like yours. Still a good bread. I understand different weather and humidity plays a big roll.I was wondering if you plan to make a video. I would love to watch it. I use four and a half cups of bread flour and half cup of rye flour or 9 grain flour. We love this recipe but it doesn't come out with a lot of holes inside and I love those holes inside. Thanx so much. I won't be making any videos. The only thing I can ask you to try is to allow the dough to sit for an hour, after you've kneaded it, and before you pop it in the oven. Add a touch more yeast too to see if that makes a difference. Good luck.